Long-distance water movement is crucial to the survival of land plants. Although plants vary considerably in their tolerance of water deficits, they all have their limits, beyond which survival is no longer possible. About 85 percent of the fresh weight of leaves can be water. On a dry, warm, sunny day, a leaf can evaporate 100 percent of its water weight in just an hour. Water loss from the leaves must be compensated for by the uptake of water from the soil. Water transport is also important for the uptake of essential mineral nutrients from the soil. Shortages of mineral nutrients such as nitrogen, potassium, and phosphorus are often limiting to plant growth, which is why fertilizers are often added to the soil to improve plant productivity and appearance. The major mechanism for long-distance water transport is described by the cohesion-tension theory, whereby the driving force of transport is transpiration, that is, the evaporation of water from the leaf surfaces. Water molecules cohere (stick together), and are pulled up the plant by the tension, or pulling force, exerted by evaporation at the leaf surface. Water will always move toward a site with lower water potential, which is a measure of the chemical free energy of water. By definition, pure water has a water potential of 0 MegaPascals (MPa). In contrast, at 20 percent relative humidity, the water potential of the atmosphere is -500 MPa. This difference signifies that water will tend to evaporate into the atmosphere. The water within plants also has a negative potential, indicating water will tend to evaporate into the air from the leaf. The leaves of crop plants often function at -1 MPa, and some desert plants can tolerate leaf water potentials as low as -10 MPa. The water in plants can exist at such low water potentials due to the cohesive forces of water molecules. The chemical structure of water molecules is such that they cohere very strongly. By the cohesion-tension theory, when sunlight strikes a leaf, the resultant evaporation first causes a drop in leaf water potential. This causes water to move from stem to leaf, lowering the water potential in the stem, which in turn causes water to move from root to stem, and soil to root. This serves to pull water up through the xylem tissue of the plant. Plants have root hairs and often mycorrhizal fungi at the root surface, both of which serve to filter the soil water as it enters the plant. Mycorrhizae are symbiotic associations between plant roots and fungi. The root cells and mycorrhizal fungi both actively uptake certain mineral nutrients. Mycorrhizae can be particularly important for the uptake of phosphate. The active uptake of minerals by living cells of the root and the subsequent transfer of minerals to the xylem can result in positive root pressures, with water potentials above 0 MPa. This occurs only under certain conditions, such as at night or during rainstorms, when water loss from the leaves is minimal. Such positive root pressures disappear with the onset of leaf transpiration. 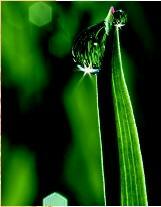 A drop of guttation, water extruded by a plant's root pressure, on a blade of grass. have pits on the sides of their walls, which include porous areas for side-to-side transport. Unlike tracheids, a vessel is composed of many cells stacked end to end, with perforations between cells, allowing for more efficient transport. The long-distance transport of the water molecule occurs first within the xylem cells of the root, then the xylem of the stem and branch, and then into the xylem of a leaf midrib and vein. Driven by transpiration, the water molecule is pulled from the nonliving tracheids and vessels of the xylem in the living cells of the leaf mesophyll (middle layer) and to the surface of mesophyll cell walls. The water molecule then evaporates into a leaf inter-cellular air space and finally out of a stomatal pore and into the atmosphere. Though photosynthetic action consumes some water, only a small fraction of the water that travels through the plant is used directly for the photo-synthetic reaction, which occurs in leaf mesophyll cells. Instead, most water is lost by transpiration through the stomates. Leaves of land plants are covered with a waxy cuticle that prevents water loss and gas exchange. The stomates at the leaf surface have guard cells that open and close the stomate to regulate the uptake of carbon dioxide and release of oxygen, as required for photosynthesis. They also serve to regulate water loss from transpiration. During the day, the stomates normally open up in response to sunlight, allowing for photosynthetic gas exchange, but also allowing for transpiration. At night, the stomates normally close, preventing unnecessary water loss. When excessive water loss occurs during the day, drops in leaf water potential can cause stomates to close. Were it not for stomate closure in response to water stress, the leaves would suffer excessive water loss, the leaf cell membranes and photosynthetic apparatus would be destroyed, and "cavitation" would occur in the xylem cells. Cavitation, which is a break in the water column, occurs when air is pulled into the xylem vessel or tracheid. This can make the xylem cell unable to conduct water. Plants vary considerably in their vulnerability to cavitation, but for most plants, stomate closure can prevent cavitation from occurring. The transpirational water loss allows for uptake of mineral nutrients from the soil. However, much of the water loss that land plants exhibit can be viewed as a "necessary evil." The stomates must open up to allow for photosynthesis to occur, and during the process of letting carbon dioxide into the leaf, water vapor is lost to the atmosphere. When the stomates close to prevent excess water loss, photosynthesis is compromised. Holbrook, N. M., M. J. Burns, and C. B. Field. "Negative Xylem Pressures in Plants: A Test of the Balancing Pressure Technique." Science 270 (1995): 1183–1192.